Virtual Wine Pairing Dinner Party! Virtual Party-Goers – Please Fill Out The Questionnaire! Winos! I know that many of you participated in the Virtual Wine Pairing Dinner Party featuring wines from Northeast Italy, the Tre Venezie. Buuuut, I don’t have much feedback from you yet! Please, oh pretty please, fill out the questionnaire (see below) so we can get compare our tasting notes! Also, please send me any pictures you may have taken from your gatherings – WinoToWineKnow@gmail.com. Coming up soon on W2WK… Results of this Virtual Party AND a Wino Journey Update (I’ve got news to share!). Only 19 Days Left to Show Up to the Virtual Wine Party! Just a quick reminder, Winos! We have only 19 days left in the current W2WK Virtual Wine Pairing Dinner Party featuring wines from The Veneto! The party ends on September 7th! Recipe and wine pairing selections posted here! And don’t forget to fill out the questionnaire! We want your opinion about the tasting! I’ve received several reports of Virtual Parties happening. Send photos of your party to me at WinoToWineKnow@gmail.com! Here’s a sneak peak of a couple of parties that have been held so far! Virtual Wine Pairing Dinner Party – A Taste of the Tre Venezie! W2WK Posts Recipe & Wine Pairing Suggestion: I have posted recipes below with recommended bottles of wine for pairing. Party-Goer Makes Food, Drinks Wine: Between now and September 7th, you make the food and enjoy it with the wine (maybe with friends?). While consuming the food and wine together, you stick out your pinky, point your nose in the air, and contemplate the flavors and aromas that are (or are not) complementary in the food and wine pairing. Party-Goer Fills Out Questionnaire: You fill out the accompanying questionnaire at the bottom of this post to share about your wine-pairing/virtual party experience. I recommend printing it out or having your iPad handy while you are eating so that you can take notes while sipping and eating! W2WK Posts Questionnaire Results: After the questionnaire closes (on September 7th), I will post the results of the questionnaire (it will be anonymous), and we all gain a little more Wine Know. This Dinner Party is about one month in duration – from August 4th through September 7th. What does that really mean? Well, it just means that I’m going to post the results of the questionnaire in a month. The wine pairing police will not come looking for you if you decide to make this stuff after the questionnaire closing date. Don’t be intimidated about sharing your experience – I know the majority of the W2WK followers and we’re all a little shy about our Wine Know. But once you start talking about it, you’ll find that you know more than you think you do! If you can’t find the specific type of wine recommended, ask the wine store expert to help you pick something else out. There is space to note that in the questionnaire! The Tre Venezie Virtual Party will be a two-course meal including a salad and an entree. There are separate wine pairings for the two courses. I recommend having a few friends over, and making both courses at the same time and having both wines available. This way, you can taste both wines with both courses to see how different the wine tastes when you change the food. In a large bowl, mix together the salad ingredients. Just before serving, toss with vinaigrette. Soave is a wine mentioned in Part 2 of the Country Series on Italian Wine. I picked this wine for two reasons: (1) It is Italy’s most well-known exported white wine and is from the Tre Venezie region (the Veneto, to be more specific). Since it is popular, it is a good one to get a sense of a wine from the Veneto by trying different bottles over time. (2) It should be readily available in most wine shops. If you see a bottle labeled “Soave Classico”, go for that over one without the “Classico” stamp. It is a step up in quality. (Soave Classico Superiore is an even higher quality rating – let us know if you find one and decide to give it a go!) Normally, I post a specific wine to try. However, most Soave wine should have similar characteristics since there is a required quality system for this area (as discussed in Part 1), so any Soave should do for this Virtual Party! Pairing Notes: Soave is a very light, fresh wine that finishes smoothly. I think it will be a great wine for the hot summer afternoons we are all having (at least in the northern hemisphere). It will pair well with the Apple-Gorgonzola salad as the fresh flavors of the wine will align to the crisp apple in the salad. The lightness of the wine will complement the strong flavors of the gorgonzola cheese. In a large bowl (so that you can include the pasta later), combine the tomatoes, half of the garlic, 1/2 teaspoon of salt, olive oil, vinegar, red pepper flakes, and a few grinds of black pepper and toss it all together. Set aside. Melt the butter over medium heat. Add the bread cubes, the remaining garlic, and 1/2 teaspoon of salt and cook until the bread cubes are browned in the hot butter, turning them as they crisp. The bread cubes will soak up the butter in the pan like a sponge. (You may need to reduce the heat if they look like they are over-browning.) Transfer the croutons to a plate and let the pan cool slightly, then wipe it carefully with paper towels. Sprinkle salt and pepper to taste on chicken breasts. Grill on the BBQ or on a grill pan until cooked through (approximately 6 minutes per side). Meanwhile, cook fettuccine according to package directions. Scoop out about 1/2 cup of the pasta-cooking water and set it aside. Then drain the pasta in a colander. Dump the pasta and 3-4 tablespoons of the reserved pasta water into the bowl with tomato mixture and toss to coat the pasta thoroughly. Add the basic and croutons and stir to incorporate them into the mix. Taste and adjust the seasoning. If it seems dry, add a little more pasta water. Serve pasta with chicken on warm plates! Valpolicella is, like Soave, a specific region in Italy and produces Valpolicella wine (also in the Veneto). For the same reasons as the Soave, look for a “Valpolicella Classico” as it will indicate a slightly higher quality (and “Valpolicella Classico Superiore” is even higher quality). Pairing Notes: Valpolicella is a light-bodied red wine that will likely have fruit flavors, namely cherry. This wine often has hints of licorice and some smokey characteristics. This light-bodied wine will accompany the light summer pasta dish nicely (light weight food matching light weight wine!) and the grilled chicken will help bring out any smokey flavors in the wine. The second W2WK Virtual Wine Pairing Dinner Party has officially come to an end. And I’m happy to report that this party was indeed bigger than the first one! (A true delight as I look at my blog post date stamps and they are few and far between over the last couple of months… I blame the heat of the summer). We had 16 party-goers who made themselves known…. and who knows how many secret partiers were out there. Thank you all for participating in this event!! Virtual Party Recap: As a quick reminder, here is what this Virtual Party is all about… I post a recipe and specific wines to try with it. You make the food and enjoy it with the wine. Then fill out a questionnaire sharing your thoughts about the wine-food pairing. At the close of the party, I post the results (anonymously) and in the end, we all gain a little Wine Know. See original post for more details. It is convenient that participating Winos are also skilled photographers! Click on any photo to see the full size. All the prep pictures were so pretty! Prep time in Denver – meat, garlic, jalapenos, panko…yum! Onions get the best of everyone. Winos are crafty. After a BBQ mishap, the indoor grill went outside to finish the job. This participating party-goer (who skipped the wine part) declared that these burgers weren’t as good as BK burgers. While she hasn’t had a BK burger, her preschool pal had assured her that BK’s burgers were the best. Tastiness – burger with home grown green beans. 3 of 5 followed the recipe, and 2 got a little creative with it. The majority of party-goers enjoyed Syrah or Petite Syrah with their burger. Some also tried it with a Dry Rosé. Syrah: 3 of 5 noticed Blackberry/Jammy flavors. 2 of 5 noted that there were Smokey flavors and Strawberry flavors. Dry Rosé: Strawberry/Ripe Cherry flavors were most notable. Note: See the W2WK Tasting Notes section below to see why both wines pair well with similar flavors. W2WK Virtual Party Tasting Notes: This burger recipe has a a lot going on in it! Jalepeño adds a spicy kick to the food, as does the arugula. Most people used white cheddar since cambozola is a little difficult to find. Both are very potent, heavy cheeses – cambozola having a blue cheese type of flavor. Typically, when pairing wines with food, you want to go with a wine that has similar flavors to the food (spicy wine with spicy food), or the opposite (light/crisp wine with hearty food). And that was the intent of pairing these two wines with this meal. The Syrah complements the heartiness of the burger and strong-flavored cheeses, like cambozola or white cheddar. Syrah can be a spicy wine itself, which leads it to pair well with the spicy flavors in this recipe – the jalepeño and the arugula. 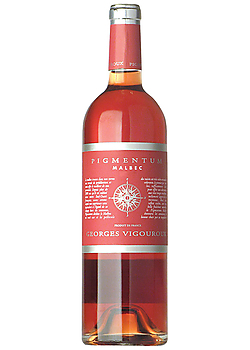 The Dry Rosé on the other hand, balances the heartiness and the spiciness by offering crisp, fruit flavors. You would be more likely to reach for the Dry Rosé if you overdid it on the jalepeños (over the Syrah)! In general, the Rosé will come across as more refreshing with any heartier meal, especially on hot days. Thank you much to everyone who participated!! I hope you all enjoyed your virtual party experience. W2WK will host another party soon…. If you have any more feedback you’d like to share about this event, please email me at WinoToWineKnow@gmail.com. You’re Invited to W2WK’s Summer Virtual Wine Pairing Dinner Party!! W2WK Posts Recipe & Wine Pairing Suggestion: I have posted a recipe below with recommended bottles of wine to try with it. Party-Goer Makes Food, Drinks Wine: Between now and August 12th, you make the food and enjoy it with the wine (maybe with friends, maybe not). While consuming the food and wine together, you stick out your pinky, point your nose in the air, and contemplate the flavors and aromas that are (or are not) complementary in the food and wine pairing. Party-Goer Fills Out Questionnaire: You fill out the accompanying questionnaire to share about your wine-pairing experience. W2WK Posts Questionnaire Results: After the questionnaire closes (on August 12th), I will post the results of the questionnaire (it will be anonymous), and we all gain a little more Wine Know. This Dinner Party is about one month in duration – from July 8th through August 12th. What does that really mean? Well, it just means that I’m going to post the results of the questionnaire in a month. The wine pairing police will not come looking for you if you decide to make this stuff after the questionnaire closing date. If you can’t find the specific bottle recommended, pick up a different bottle of the same wine type! There is space to note that in the questionnaire! This burger is inspired by a combination of “The 5th And Wine Burger” from 5th And Wine in Scottsdale, as well as the burger made by W2WK Supporter, the “Karate Kid”. Serving Size: Makes 2 burgers. Form beef into hamburger patties. Use your finger or thumb to indent the center of the patty on both the top and bottom. This will help keep the burger flat as it expands when being cooked. Grill patties until cooked to taste (approximately 10 minutes for medium for most grills). Add cheese while burgers are still on the grill, but before they are finished so that the cheese melts just slightly on the burger. Meanwhile, melt butter and mix in the last clove of minced garlic. Brush inside of kaiser rolls with butter mixture and place buns on grill until toasted. When burgers are cooked to taste, remove from grill, place on bottom burger bun. Add arugula on top of the patty/cheese and serve. Serve burgers with roasted asparagus and boiled red potatoes flavored with fresh parsley, salt/pepper. Wine: W2WK recommends two very different wines to enjoy with this tasty burger. And hey, it’s summertime, so get wild and pick up a bottle of each to make a night out of it. Try it with a Syrah and/or a Dry Rosé. To really get the full experience, open both bottles WHILE enjoying the burger and alternate bites of the burger with sips of the two wines. It will help make it more clear which wine you may prefer with the burger – or why you enjoy one for different reasons than the other. It is also fun to try it with friends and find out different preferences. Make sure that the Rosé is served very cold while the Syrah is slightly chilled. Syrah: Syrahs generally go well with hearty meals such as grilled meats and strong-flavored cheeses, like Cambozolla. The burger will be a little spicy due to the jalepeño in the patty, and a medium-bodied Syrah (as opposed to full-bodied Syrahs) can accompany spicy food well. Dry Rosé: The Rosé will be a completely different pairing to the burger than the Syrah. While the Syrah accompanies the heartiness of the burger, the Rosé will counter balance the flavors with its lightness and crispness. Fill out this questionnaire about the wine pairing experience to share your Wine Know! After August 13th, I’ll post the responses from all parties. And send pictures of your event to me at WinoToWineKnow@gmail.com. The inaugural W2WK Virtual Wine Pairing Dinner Party has – like all good things do – come to an end. I gotta say, this party was full of fun people from all over… we had participants in Arizona, Virginia, and North Carolina! Virtual Party Recap: As a quick reminder as to what this Virtual Party is all about… I post a recipe and specific wines to try with it. You make the food and enjoy it with the wine. Then fill out a questionnaire sharing your thoughts about the wine-food pairing. At the close of the party, I post the results (anonymously) and in the end, we all gain a little Wine Know. See original post for more details. Oh, the memories! Click on any photo to see the full size. Virtual Party in North Carolina! Pizza heading into the oven in AZ. Overachievers who made the dough from scratch. 8 of the 11 followed the recipe, and 3 got a little creative with it. All 11 enjoyed either Sauvignon Blanc or Zinfandel with their pizza. Sauvignon Blanc: The majority of the Winos noticed peach and nectarine flavors. 60% noticed apple and pear flavors. Zinfandel: The majority noticed smokey, tobacco flavors in the wine as well as black pepper, cloves, and cinnamon. W2WK Virtual Party Tasting Notes: Everyone had such great comments above and basically said the same thing the experts say! Because this pizza has so many different flavors, it is a good example of how pairing two very different wines (a dry white and a big fruity red) can go well with the same dish. The Sauvignon Blanc serves as a contrast to the smokey canadian bacon flavors and accompanies the shrimp and feta flavors. The Zinfandel, on the other hand, really brings out the tomato sauce while working with all the other peppery flavors in the pizza. As Mr. Goldstein (the recipe originator) noted, these wine pairings are “an intriguing food and wine conundrum…”! I don’t know about you but I am a fan of finding myself in food and wine conundrums. Thank you much to everyone who participated!! I hope you all enjoyed your virtual party experience. And a special thanks to the Dreamer, who wins the prize for hosting the most actual parties! If you missed this one, don’t worry… another Virtual Wine-Pairing Dinner Party is just around the corner! Virtual Wine Pairing Dinner Party: Reminder and Party-Goer Photos! Winos! There are only 11 days left for the W2WK Virtual Wine Pairing Dinner Party! If you missed the original post, check it out – it includes a recipe for a tasty gourmet-esque pizza and two different wine pairing recommendations. There’s also a questionnaire to share what you think about this food/wine combination. 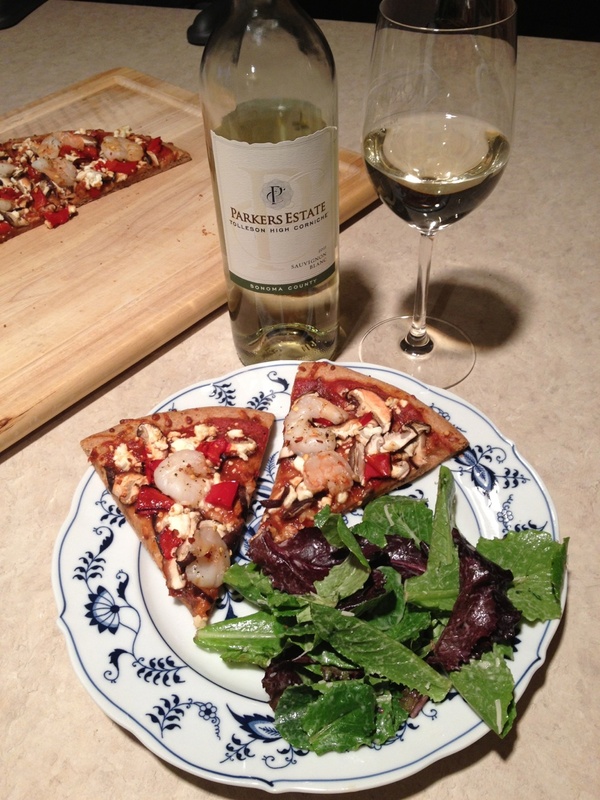 Party-goers so far have reported that the pizza recipe IS in fact tasty (even with shrimp on it), and the wine pairing works well. A few have submitted photos from their “social” dining experience. What are the benefits of a Virtual Dinner Party?? Well, you don’t have to clean your house. If you mess up the recipe, no one has to know. No one will judge you for scarfing down your food too fast or guzzling that bottle of wine. AND you still get to say you had a social evening! The questionnaire closes on May 13th… Virtual Party details posted here! The results of the questionnaire will be (anonymously) posted on the blog and we can all see how this pairing worked out. If you participated and have a photo, send it to me at WinoToWineKnow@gmail.com or post it on my Facebook page: www.facebook.com/WinoToWineKnow. You’re Invited to W2WK’s First Virtual Wine Pairing Dinner Party!! 1. I have posted a recipe below with recommended bottles of wine to try with it. 2. Between now and May 13th (one month! ), you make the food and enjoy it with the wine (maybe with friends, maybe not). While consuming the food and wine together, you stick out your pinky, point your nose in the air, and contemplate the flavors and aromas that are (or are not) complementary in the food and wine pairing. 3. You fill out the accompanying questionnaire to share about your wine-pairing experience. 4. After the questionnaire closes (on May 13th), I post the results of the questionnaire (it will be anonymous), and we all gain a little more Wine Know. This Dinner Party is one month in duration – until May 13th. What does that really mean? Well, it just means that I’m going to post the results of the questionnaire in a month. The wine pairing police will not come looking for you if you decide to make this stuff after the closing date. What do you say?! Are you in? If so, Welcome to the W2WK Party! Below is the recipe, the wine, and the questionnaire! Credit: The Recipe is taken directly out of the Sid Goldstein’s book, “The Wine Lover’s Cookbook”. He recommends a type of wine to enjoy with each recipe in the book. I’ve added to that and recommended a specific bottle of that type of wine below. Pizza Dough: I’m guessing most of us Winos don’t want to make pizza dough from scratch. So I’m modifying the receipt slightly… instead of making your own dough from scratch, head to your local grocery store and pick up some uncooked pizza dough. Or pick up a pre-made pizza crust. Place pizza dough on a 12-inch pizza pan that has been dusted lightly with flour. Using hands, stretch dough out and press it down to a 1/2-inch thickness to fill the pan, keeping the edges a little thicker. Whisk together tomato sauce, roasted garlic, dill, salt, 1/4 teaspoon black pepper, and lemon juice. Spread evenly on to pizza. Top pizza with Canadian bacon, mushrooms, peppers, and feta cheese. 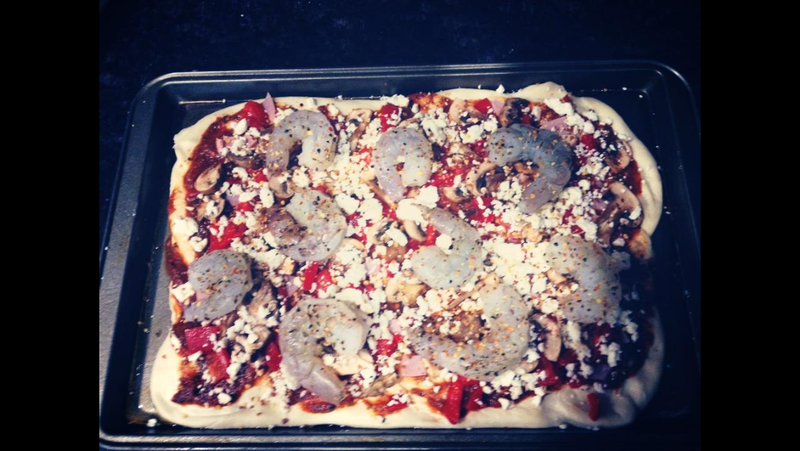 Sprinkle 1/4 teaspoon black pepper on to shrimp and space them evenly on pizza. Sprinkle with red pepper flakes. Preheat oven to 450 degrees (F). Bake pizza on the top rack of the oven for 16-18 minutes or until crust is golden brown. Slice into pieces and serve. Wine: Sid Goldstein recommends a Sauvignon Blanc and, as an alternative, a Red Zinfandel. I encourage you to try both and see the differences in flavor you might experience! W2WK’s (Specific) Wine Recommendations: If you want to go with the Sauvignon Blanc, try the Kim Crawford Marlborough Sauvignon Blanc from New Zealand. This is in the $10-15 range at wine shops and grocery stores. 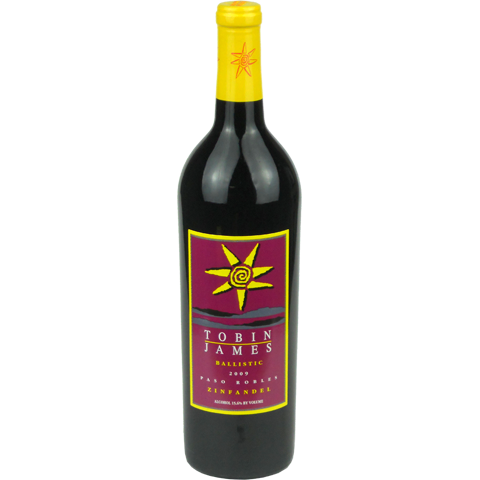 If you prefer to taste your pizza with a red, go with the Tobin James Ballistic Zinfandel from Paso Robles, CA. This is in the $10-15 range at Costco and other wine retailers. W2WK Dinner Party Questionnaire: Once you’ve had a chance to enjoy some combination of this recipe with one (or both) of these wines, share your thoughts about the pairing and the party in this questionnaire. It might be helpful to have this list of potential flavors nearby while eating/boozing. Also consider what flavors in the pizza go best with the wine. Tell us about your Wine-Pairing Party by filling in the questionnaire linked below!